Gareth Metcalfe is a Maths Consultant and highly skilled teacher of Maths, who is working with classes in Northop Hall this year. 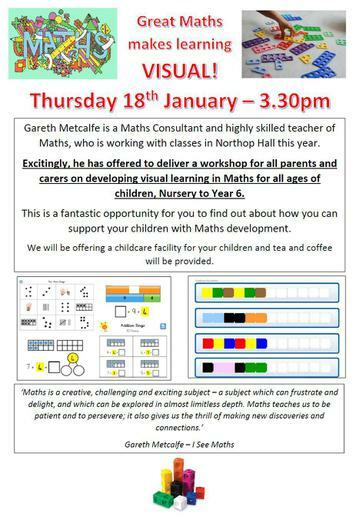 Excitingly, he has offered to deliver a workshop for all parents and carers on developing visual learning in Maths for all ages of children, Nursery to Year 6. This is a fantastic opportunity for you to find out about how you can support your children with Maths development. We will be offering a childcare facility for your children and tea and coffee will be provided. We are looking forward seeing as many of you as possible at this fantastic workshop that will help you in supporting your child's progress in Maths.